Take a nostalgic look at days gone by! From springtime flowers, Memorial Day and July 4th to the Harvest Moon of Autumn and a sleigh ride in winter, sing along and reminisce to old favorites while you move gently to the lyrics. I have both of the music 'n motion DVD's. We use this with the elderly at all level of care. We use the exercise videos daily for our exercise program. Our residents love it! I use this with the residents at the assisted living where I work. They LOVE it! 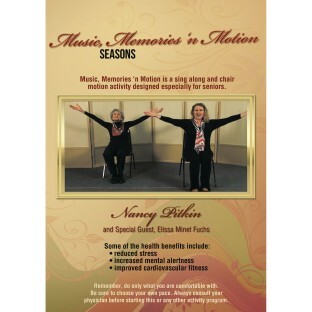 The music is familiar to everyone and the seated exercise and stretching are gentle.